Contact Surval Boutique Olive Estate for superior country accommodation, excellent South African cuisine and a superb venue for weddings, functions or conferences. From the N12, enter Oudtshoorn with Voortrekker Road. At the third traffic light, turn right into Baron van Reede Street. Follow Baron van Reede Street out of town towards the Cango Caves (R328). From Caves Retirement Village (last houses on the left) it is 4.2 km to the turn-off of Surval Boutique Olive Estate. Turn left onto a gravel road. Surval Boutique Olive Estate is 1.1km along the gravel road. 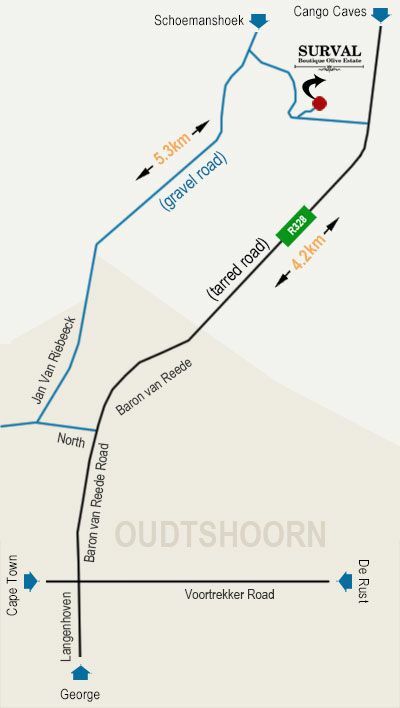 From the R62 you will enter Oudtshoorn with Voortrekker Road. At the third traffic light you’ll turn left into Baron van Reede Street. Follow Baron van Reede Street out of town towards the Cango Caves (R328). From Caves Retirement Village (last houses on the left) it is 4.2 km to the turn-off of Surval Boutique Olive Estate. Turn left onto a gravel road. Surval Boutique Olive Estate is 1.1km along the gravel road. From the N12 you enter Oudtshoorn with Langenhoven Road. At the first traffic light Langenhoven Road becomes Baron van Reede Road. Follow the road out of town towards the Cango Caves (R328). From Caves Retirement Village (last houses on the left) it is 4.2 km to the turn-off of Surval Boutique Olive Estate. Turn left onto a gravel road. Surval Boutique Olive Estate is 1.1km along the gravel road.